Home » The Tony Robbins Blog » Productivity & Performance » What is productivity, really? The classic productivity definition is “a way to measure efficiency.” In an economic context, productivity is how to measure the output that comes from units of input. Farming makes for a good example: One acre of land that produces 10 pumpkins? That’s not very productive. But one acre of land that produces 2,000 pumpkins? That’s a much better return on your pumpkin planting. But what is productivity, and how do we calculate it in our daily lives? It’s easy to produce theories and examples based on abstract units of work or numbers of plants, but your life isn’t a managed supply chain. Writer Charles Duhigg defines productivity as “making certain choices in certain ways” that moves us from being “merely busy” to “genuinely productive” in his book Smarter Faster Better. 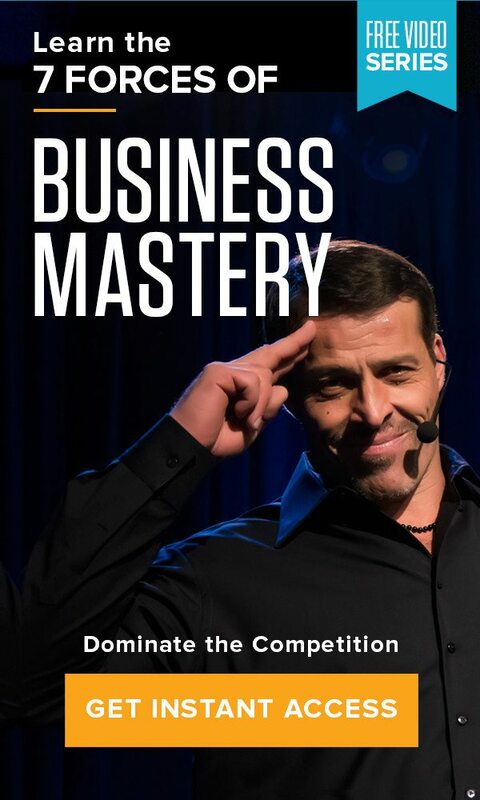 Tony Robbins’ approach to productivity focuses on ways people can systematize and better manage their lives so they have more time to do what they want. It’s getting the results you want with less time and effort. When you’re trying to understand how to be productive, what you’re really seeking is a way to achieve your goals while having time to spend on what matters. “We’re living through an economic revolution,” Duhigg said in an interview on The Tony Robbins Podcast. As our economic drivers have shifted, productivity has become an increasingly important concern. When you think of someone productive in your life, you may immediately picture a person who is busy all the time. This individual is constantly moving through tasks, pushing deadlines and seemingly trapped under a pile of duties that seems to grow each day. We often make the mistake of equating just being busy with being productive, but they aren’t the same thing. When you’re meeting the true definition of productivity, you won’t be chasing deadlines or running five steps behind on everything you need to get done in a day, week, month or year. It’s quite the contrary; you’ll probably be ahead of schedule. The bottom line is that we all have 24 hours in a day; productivity is being able to make the most of them and create lasting habits of achievement and fulfillment instead of chasing endless lists of tasks. In other words, work smarter, not harder. Why do you want to increase your productivity? The most obvious answer that will probably come to mind is that you’d like more free time to do the things you enjoy doing. If you’re able to reach your goals sooner, that leaves you time to set and achieve other goals, whether that’s relaxing with a book or learning a new skill. As a bonus, if you accomplish tasks with more ease and frequency, you’ll see a decrease in life stressors – rather than running around trying to get everything done, you’ll see your duties completed in a timely manner. But productivity without passion is just checking goals off a list. Why have you set those goals in the first place? If you really want to increase your productivity, think about what’s driving you to do so. Sure, you probably want to make more money at your job or be able to go on more vacations, but why? What’s the hunger or purpose that’s driving your actions? Do you want to be the best version of yourself? Do you want to take better care of your family, your community or the environment? Keeping your ultimate purpose in mind will help steer you, even when the waters get murky. We’d all like to succeed with less effort. But how can you calculate productivity, let alone increase it? Your first step is to find some models of what productivity means and what it doesn’t mean to you personally. As Tony says, success leaves clues. Failure does, too. If your desire to increase your productivity begins at work, model your success after a colleague noted for their productivity. Look for someone who’s got a clear vision for their day, sets limits on their time and even gets projects done early. Ask them how they designed their particular structure and if they’re using any tools. You can start to design your own method based on theirs. By finding people that embody the type of meaningful productivity that resonates with you, you can start to visualize what increasing your productivity will mean for your life, both at work and at home. It would be nice to say “I’m making a change” and then it just happens with no further effort on your part. But better productivity, like any other shift in your life, requires some work on your end. It can take up to three months to form a new habit, whether that’s creating a daily checklist of tasks to guide your day or building out a weekly gym habit. Once something becomes a habit, it becomes much easier to integrate into a routine. Soon, you realize that a task can become second nature. By turning productivity into a habit, you can achieve far more in your professional and personal life. If you need some further guidance in productivity and habit-building, Tony’s 3 Pillars of Progress are a good place to start. There’s a big difference between movement and achievement; while to-do lists guarantee that you feel accomplished in completing tasks, they don’t ensure that you move closer to your ultimate goals. There are many ways to increase your productivity; the key is choosing the ones that are right for you and your ultimate goals. As you work toward becoming more productive, you’ll cut down on wasted time and you’ll get back to focusing on what it is you really care about.